Night fell like a shroud over Helm’s Deep. A heavy cloud cover, bringing early darkness, promised rain. As men rushed in all directions through the smoky night air, I stood uncertainly with a few other men who had gathered around a brazier, seeking solace from the darkness in the leaping flames. Between my cold hands rested the blade of my sword. I tried to force the dark figures of my imagination from my thoughts and looked up as a voice broke the silence. “Perhaps,” said a new, rather gruff voice. “But we shall fight and die as men of Rohan.” We all looked up as a middle-aged warrior with a thick beard joined us. The firmness of his tone subdued Bregolas. I wished that they had not spoken at all; somehow breathing fear into the open made it all the more real. “We will fight and die as men of Rohan.” The idea of death had not often occurred to me in the past; as a fourteen-year-old stable boy to King Theoden, my days had been filled with work, peace, and hope for a future as a master horseman. Death had been perhaps a distant thought, but now it loomed ahead as an inescapable reality. The men continued to talk, but lost in my thoughts, I did not hear them. I had a sudden, fierce desire to be with my family again, to relive the days of the past. If only I could disappear into the world of my memories! But perhaps that was the desire of a coward. Firmly I told myself, looking down at the blade of my sword, that I was a man of Rohan, and I would fight and die to defend my country. Still, for now, it was all I could do not to remember the tears in my mother’s eyes as a king’s warrior had sorrowfully pulled me from her arms. Gradually I became aware of a pair of eyes watching me, and I turned to meet the blue gaze of Lord Aragorn, the Ranger from the north who had ridden beside King Theoden. Embarrassed, I turned back, but I felt those eyes lingering on me still. Hesitantly, I turned back. His eyes were piercing but mild as he gazed at me. There were rumors among the men of his spectacular swordsmanship, and that he had lived among elves and been on many journeys. But here, sitting alone in the dark on the steps of the Keep, he looked much as I felt: human and alone. He did not reply immediately. Instead he stood, claiming a firmer grip on the sword, and began to slice a series of arcs and half-cuts through the air. The strength of his wrist was amazing; the sword flew in his grip, an extension of his arm. As I imagined this blade in action against the enemy, I began to feel more hopeful. An hour later his words still rang in my head as I climbed a set of stone steps to the outer wall. My orders had been to take my station in the front line on a section of the wall near the gate. As I took my position, I pulled the bow from my quiver and strung it. After a few minutes, I glanced up and realized that the man standing to my left was the gruff-voiced warrior from before. Only now, he looked rather sickened as he glanced down at me. “Young to be in the front lines, aren’t you?” he muttered. I regarded him closely; the sides of his helmet obscured his expression, but I could guess it easily enough from his tone. A sudden, powerful horn blast shattered the mild hum of activity within the fortress and left behind it a deathly silence. Panic crawled up my spine. Surely they couldn’t be here already? Leaning forward against the roughly-cut stones of the wall, I squinted into the darkness, and could make out a group of figures, probably a few hundred, marching up the stone ramp straight towards the gate. Every now and then, a weak glimmer of torchlight from the fortress walls allowed me a glimpse of metal or soft cloth. It did not feel at all like an army of attacking orcs. From somewhere along the wall came a shout: “Open the gate!” and I knew it could not be. The gates groaned open and I turned and ran toward the end of the wall, overlooking the courtyard that opened out from the gate. Several others followed me, leaning over the stones to look. I watched in growing wonder and amazement as columns of Elves, cloaked in grey, marched in to the courtyard, led by a singular Elf, tall and regal. Shining armor glimmered beneath the folds of his red cloak; the sight left me breathless. Once completely within the fortress, the Elves came to a halt as one. Their leader stepped out to meet King Theoden as he descended a flight of stone steps, awe and disbelief written over his face. “How is this possible?” I heard him say. Movement caught the corner of my eye and I turned to see Lord Aragorn run to the head of the stairs and stop suddenly at the sight of the Elves. The impact of the Elf’s words reached me fully; they would fight with us. Once more, I heard Lord Aragorn’s words and I smiled. The silence of anticipation had fallen fully over Helm’s Deep, and every pair of eyes was trained on the dark horizon. I lay an arrow across my bow and tried to slow my breathing. There was a flash of lightening, following by an angry growl of thunder. I inhaled sharply as the sudden light revealed the dark tidal wave of the enemy spreading across the horizon. The light faded and dots of torchlight became visible along the skyline. I swallowed hard and reached down to touch the hilt of my sword. There is always hope, I told myself silently. Hope for Rohan; even if we die, even if the fortress is taken. Somehow, there is hope. There was another crack of lightening and rain fell in untamed fury. The next minutes were agonizing as we waited for the enemy to come within range. As they drew closer and became clearer, it was all I could do to keep from being sick. Even as their front lines drew near to the fortress, they still stretched to the sky. I stroked the arrow as the Uruk-hai advanced, an unstoppable force, drawing nearer and nearer. The sound of their tramping became a drum beat, a rhythm to the dance of death. Even from where I was, I could see they were massive; at least twice the size of any orc I had heard tell of. Their roars and shouts were hideous; I forced my trembling hand still and lifted the bow, drawing back at the sound of a shouted order. Farther down the line, I recognized Aragorn’s voice calling in Elvish. Then suddenly, a few hundred yards or so from the wall, they stopped and all was silent except for the rain and the pounding of my heart. Then, from somewhere in the fortress, a single arrow shot straight into the neck of one Uruk-hai on the front lines, and it fell face-down into the mud, dead. From somewhere Aragorn’s voice shouted words I could not make out, no doubt an order to hold, but it was too late. The leader of the Uruk-hai, from his stance on a rock, thrust his sword forward and roared. Their front ranks broke into a run towards the wall, and I swallowed, hard. “Aim! Release!” cried the voice of a captain, and I let my arrow sing and bury itself into the underarm of an Uruk-hai. Quickly I drew another and fired, thus settling into a rhythm of draw, aim, and fire, which soon blurred together into a desperate attempt to stop the charge. At the sound of metal grating against stone, I turned to see a ladder clamped against the wall a short way down. Dropping the bow, I drew my sword and kissed the blade. For Rohan, I thought, and for Aragorn. I would not fail either of them. The first Uruk-hai that made its way onto the battlements was instantly struck down by a warrior, but soon they overwhelmed the first men and spread along the wall. One of them, massive and ugly, towered over me, and I ran my blade through him. Black blood covered the sword, but another one was nearly upon me before I had time to think about cleaning it. The Uruk-hai may have been big and monstrously strong, but one thing worked to my advantage; I was small, and as this one struck down at my head I rolled under his legs and slashed at him from behind. As soon as one was dead, another filled its place; this we learned quickly. More ladders clanged against the wall, and I fought with an increasing zeal, faster and harder, growing accustomed to the feel of a sword in my hand. I did not allow myself to think about the thousands still outside the walls, but forced myself to focus on each one as it came. Once I very nearly was cut to pieces as three of them surrounded me; my sword-arm was wounded, but I was saved as arrows pierced two of them and I was able to finish off the distracted third. Thus the longest night of my life began, and it would not end quickly. I had just found time to crouch behind a barrel of arrows and bind my bleeding sword-arm when there was a deafening noise and the wall rocked beneath my feet. Standing to look, I was nearly decapitated by an Uruk-hai, but I ducked in time and stabbed upwards. Pushing the body away, I looked to the right and saw dust settling, and a gaping hole were a section of the wall had once stood. My jaw dropped and, forgetting fear for the moment, I ran towards the gap where the enemy poured in. Some sort of bomb must have caused the wall to explode, but there was no time to consider how. I leapt down to the ground and turned to face the enemy, and suddenly found myself fighting back-to-back with the gruff-voiced warrior. Sweat beaded down my forehead and dripped into my eyes as I fought with an effort and intensity I had never known before. Even then, we were grossly outnumbered, and I glanced around desperately for a sign of help. Then suddenly we were surrounded by Elves, and I saw vaguely the figure of Aragorn charging into the enemy. I joined the charge, losing sight of the warrior, and slashed furiously at the first Uruk-hai. I heard someone shout and turned, but then everything darkened and whirled as something struck the back of my head. The last thing I remembered was the sight of the muddy ground rushing to meet me. “To the Keep! Retreat!” a voice shouted, and I looked up groggily from the mud. Several voices repeated the cry as figures swirled around me, vague, nameless shapes. My fist was still clenched tightly around the hilt of my sword, seeming to have the only strength in my body. Suddenly I felt a strong hand grab my arm and pull me up. “Use your legs if you want to see the dawn,” the familiarly gruff voice said in my ear, and I tried to run, but I felt so weak. Slowly things came into focus; we were running up steps and through the doors to the Keep, which were closing. Once inside, the warrior released me and I stood unsteadily, looking around at the inside of the stone hall. A few warriors, so very few, were running with boards, chairs, tables, and other pieces of furniture in an attempt to bar the doors. Already I could hear the Uruk-hai banging against them. 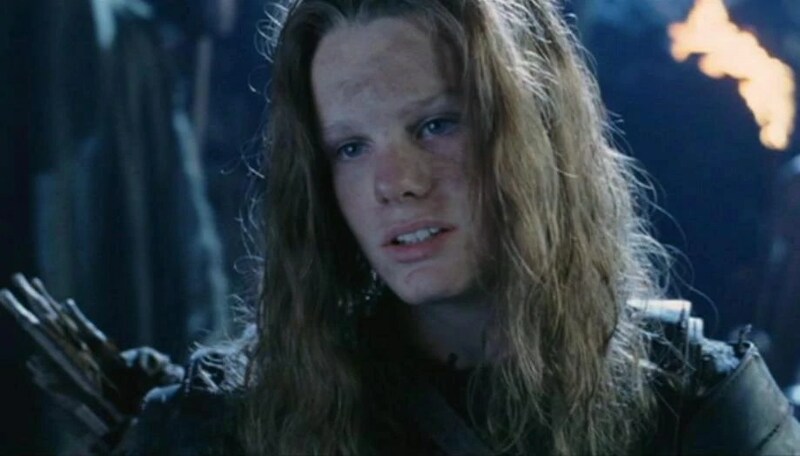 As my mind cleared, I began to search the faces of the surviving warriors, becoming desperate as I did not find Aragorn. Then I heard his raised voice and relief flooded me. “You said this fortress would not fall while your men defended it. They still defend it! They have died defending it!” His voice grew to a shout as he addressed the king. King Theoden looked defeated and did not respond. I moved to help the gruff, bearded warrior from before, who was carrying a bench to the doors. As we laid it across them, they jumped with a vicious push from outside. “They’ll break through before long.” The man’s voice was weak and dispirited; blood ran down one side of his face. Impulsively, I reached up to put a hand on his shoulder. “There’s always hope.” I thought I saw a trace of a smile on his lips, but, embarrassed, I turned away. Aragorn was still apparently arguing with the king. As I stepped nearer, I heard his words. “For death and glory?” Theoden asked. Slowly, a light touched the king’s eyes. I swung quickly into the saddle of the black horse and gathered the reins. Pulling my bloodied sword from its sheath, I looked over at the bearded warrior and gave a half-smile, which he returned. There were no words sufficient for that moment. “Forth Eorlingas!” shouted the king, and as the gates broke open under the strain of the Uruk-hai’s blows, he kicked his horse into a gallop and we followed, trampling and knocking Uruk-hai from the ramp and riding down into the masses. As the first light of day touched the eastern sky, we made our last charge against the enemy. Striking down from the back of my horse, I knocked away a clinging Uruk-hai for what seemed the hundredth time, then looked up as a shrill horse’s whinny cut through the sounds of battle. Silhouetted against the flood of light in the east, a solitary white horse reared onto its hind legs, its rider a man cloaked in white. Then another joined him, his fair hair caught up in the wind; even from a distance he seemed familiar. “Lord Eomer!” The gruff-voiced warrior appeared beside me, his face radiant as he gazed to the east. His firm hand clapped against my shoulder and we exchanged a brief smile. The few remaining warriors echoed his shout from across the field. It was truly over. I looked to where Aragorn was, astride his horse, and our eyes met. He had been right. You have taken one of my favorite scenes from “The Two Towers” and done a fascinating elaboration for the perspective of the young warrior who takes hope in the stirring words of Lord Aragorn! You really drew me into the story, and kept me emmersed to the very end. I really like the way you emphasized that the “hope” Aragorn was speaking of transcended even the battle itself and their survival chances, but took on a theological resonance of that undying Hope that Christians have in Christ. Wonderfully inspirational! Not bad, but I hope you won’t mind me critiquing a bit. This is wonderful, based off the movie. In the book, Eomer was at Helm’s Deep, and the only Elf was Legolas. The word “Rohirrim” refers to the people of Rohan as a whole, I believe, but more specifically the army. The reinforcements who arrived at dawn were Erkenbrand and men of the Westfold, survivors of the Battle of the Fords, where Theodred, son of Théoden, died. They were gathered together by Gandalf just in time to help defeat the Uruk-Hai. But other than that, it was a wonderful read!